Discussion in 'Pinball with a VENGEANCE' started by mwong168, Dec 6, 2016. Been a while since I did one of these, life is busier than ever, I took up a volunteer job with the IFPA and that chews up pretty much all of my spare time. But since I recently acquired this game I figured what the hell, let’s do this, since I get asked all the time “What’s so great about this game?" 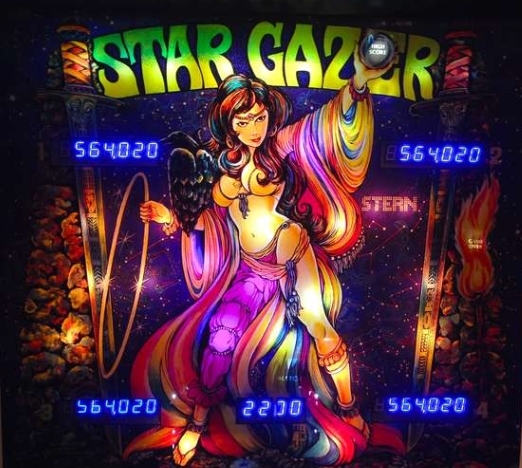 Stargazer has been a grail machine for me for I think it had been about 6 years of searching. I lost 3 different copies of the game in that time and finally found one off some random guy on Kijiji. Anyway like I said when I tell people that I have been looking for this game for so long they ask why. First and foremost, the layout, I love unique layout games and Stargazer has a very unique layout. No inlanes, just the outlanes, two rollovers right by the flippers, 3 spinners, 3 sets of drop targets and really not a lot of direct shots, but everything on the playfield matters in some way. The main bread and butter of this game is the spinners, this game is the ultimate spinner game, if you like spinners this is the game for you, and I like spinners! There are 3 spinners on the game one on the right, one on the left and one at the top left of the machine. The left and right spinner aren’t really worth much when they are unlit but when lit, they are worth 2,000 points a spin! Lighting them is interesting, beside the flippers are these rollovers with 4 inserts 2 of the inserts spot one of the zodiac stand up targets and the other two inserts light the corresponding spinner. So if you are on the right flipper and get the “Light spinner” rollover it will light the left spinner, and vice versa for the left flipper. The left and right spinner will stay lit until it is spun and then once spun the light goes out and man these spinners can spin! But no matter what even if you brick the shot and only get 1 spin, the light turns off, but if you nail the shot and the game is setup correctly, you can get 100,000 – 150,000 for a single spin, it’s such a fun and amazing feeling to really nail the spinner and the sound effects are great also. But where the real money is in this game is the upper left spinner. It doesn’t light like the other spinners do, it’s either on or off. When it’s off it’s not worth much, but if you do it right, to turn it on, it can be worth as much as 4,000 points a spin! The way you turn it on is via dropping just one of the drop targets of the top bank of 3 drop targets. There is a value that strobes, starting at 500 and going all the way up to 4000. The spinner value is determined by what insert the light stops on when you drop any of the 3 drop targets. If you clear all 3 and reset the bank you are awarded a score that is associated with that insert but it un-lights the spinner. So the best thing to do is drop a single target when the value is 4,000 and then just sit there spinning that spinner until all 3 drops reset at some point from random ricochets and misses. Then drop a single target down and start spinning again. The problem is that spinner is only hittable from the right flipper, the geometry of the playfield makes a backhand to the spinner impossible. Also since it’s so far on the back of the playfield it’s not the easiest thing to hit and if you miss early on your shot you usually end up hitting those upper drops and possibly clearing the bank so that can be an issue as well. So I’ve gone over the spinners, but what else does this game have to offer? Well all around the playfield there are these standup targets that represent each of the Zodiac signs, so 12 standups in total. You can collect zodiac signs via either hitting them directly or going over that same rollover down by the flippers. The zodiac signs represent you bonus and are calculated via the stars in the center of the playfield every time you hit a standup a star will light up in the center of the playfield and each start is worth 1,000 points. Get all 12 and you light up the 12,000 insert, get them all again, light up the 24,000 insert, light them all up again and get the 12,000 and 24,000 insert Bonus holds over from ball to ball, so fill up the bonus on ball one and you’ve got a nice head start on a good score. I’m pretty sure bonus X doesn’t hold over, or if it does, it’s a dip switch setting for it to hold over or not, the same could be for what I mentioned above about the bonus being held over ball to ball. But anyway regardless, once you have a big bonus of course you want some bonus X! You can add to your bonus X by completing either the bank of 3 drop targets on the left or right of the machine. Completing the upper left bank is only about the spinner on only awards a set amount of points based on the value from the insert. The bonus X works much in the same way the bonus does, so you can get to a maximum of 10X for bonus, and considering bonus maxes out at 48,000, with a 10x you could be in for some HUGE points J But it is a lot of work to get there, and really you are going to be spending your time going after the spinner anyway so I find the way I play, bonus and bonus X are just something that happens rather then something I actively look to accomplish. So there you have it that pretty much explains everything there is to Stargazer. It’s not much, but how much can you really expect for a game of this era??!! For the era, it is a lot of game, like I said above the unique layout is really fun to play, the little saucers with the roll over create from some unique ways to play. You can try and cradle the ball and tap it back over the roll over to light your spinners or another zodiac light, and the lack of inlanes is always kinda interesting. But the spinners, of the spinners! Classic sterns are known for their spinners and this game is all spinners! So if you like spinners, this is the game for you. Problem is if this is the game for you, good luck finding one! Like I said above it took me about 6 years of searching to find one and I doubt that is gonna get any easier. But that being said there is now one permanently available up in Keswick, so if this sound like a game you’d like to try, show up for TOPL night when it’s at my place or shoot me a PM, I’m always happy to open my doors for a fellow member of the community! WARLOCK and Menace like this. Nice review! It's been a while. Just a quick note to add. Those chasing lights actually show two values. On one side it shows the value for the spinner and on the opposite side it shows the value for completing the same drop target bank. So, if you lock in a really good spinner value like 3500 or 4000 pts, the completion value on the bank is minimal. However, if you accidentally manage to lock in the lowest insert, the spinner value is something like 500 pts, but you'll get 100K for completing the bank. I think the progressive bonus is a neat feature and certainly makes for some great end of ball countdowns with the awesome audio attributed to it. In contrast, a contemporary of SG like Quicksilver doesn't hold bonus at all and forces you to start each ball from scratch... although I think it carries over a base bonus value of 75K if you can complete the QUICKSILVER targets in one ball. Building up bonus early in Star Gazer makes for some good fun chasing bonus X. Reminds me of games like Bally Eight Ball or Frontier. Ball 1 can be critical. What I really love about Sterns of this era is how they would shake features up in every game so they all felt a bit different. Meteor allows you to build bonus X on each ball but messes with you if you can't get from 6x to 7x and light the wow, then it drops you back down to 4x I think. SeaWitch forces you to build up a bonus and then, once full, allows you to collect it during play at 2X if you can make the riptide shot. All of them have neat features for increasing spinner values and, if you're not playing in a tournament, they all have cool ways of earning an extra ball or special. Here's a couple of shots of my baby; recently refurbished. Maybe one day you can cover some of the more complex classic Sterns such as Big Game or Catacomb? Those still confuse the hell out of me. If anyone with a SG feels the bonus/bonus X carry over is a bit much from ball to ball, there are ROM's available to drop this down to I think 4x after each ball. Nice write up. Glad I own a nice copy. I played one at the Neighbourood Pub in Ottawa and really think it's the best classic Stern. They have the best wings in town. I really like your reviews. You should post them more often. This was a great Saturday morning read with my coffee and the family still asleep. I played one for my first time a month ago and thought it was a great game. Its not the best classic stern (imo) but definitely beautiful and great spinner shots as you say. Thanks for the trouble writing this all up and look forward to more input on more pins.